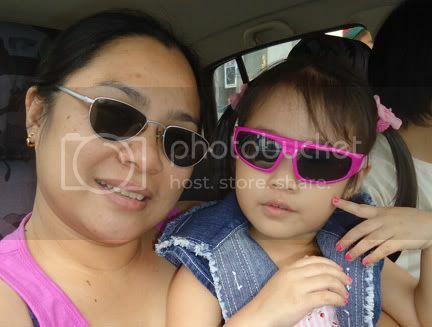 While Papa was filling up the car at the gas station, Mama and Dindin had a little photo shoot. We were both wearing sunglasses at that time so it was a nice photo opp. Look at her nails! There were really difficult moments last year between Dindin and me. I adjusted to my work at home schedule yet in the end, I felt so stressed and harassed that all my frustrations are usually poured out on Dindin. Every little mistake gets reprimanded rather severely. I was always in a bad mood. While I resigned after four months, the moodiness continued as I kinda struggled to recoup the income lost because of quitting my part-time job. Thankfully, God has rehabilitated my work at home stint while at the same time giving me more opportunities to spend quality time with Dindin. Almost immediately that I changed my attitude and the way I handled Dindin, she also seemed to change overnight. She responded well to positive stimuli more than anger or punishment. Well, of course, there are lapses, but we generally have more peaceful and happier days together. What I learned? There are just some things you cannot get by force but rather by gentle persuasion. At least, I am successful most of the time. Speaking of success, you might be interested in buying cheap morgan dollars for investment. It is a great way to pay off debts or to save up for the future. I will have to look at more investment opportunities if our finances will allow it. Inta2 ka nails ba.. Hihi..
Children can be really “makulet” but if you talk to them nicely and explain things to them they will obey you.